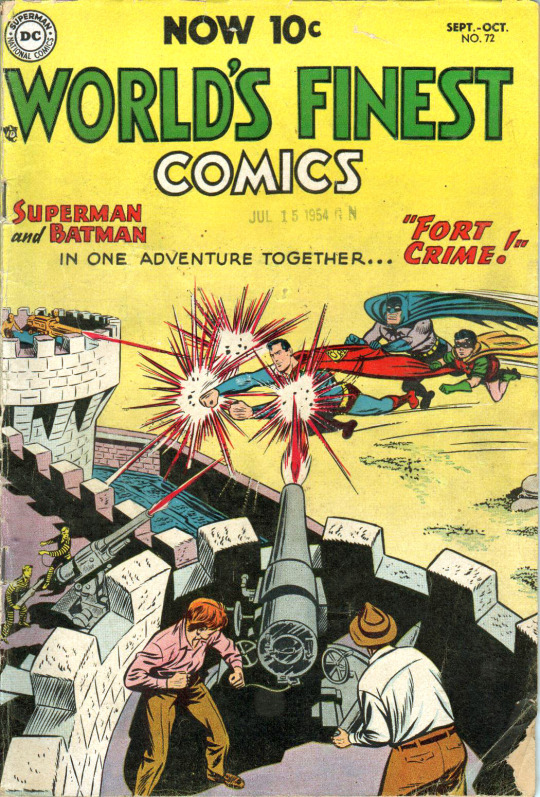 Superman and Batman appeared together on all the covers of World’s Finest Comics since it’s beginning in 1941 but it wasn’t until the issue just before this one (#71) that the comic would feature a story of the two heroes together. They would then team up in every issue until it folded in 1986 (except for a brief period in the early 1970s when stories featured Superman teamed with other heroes besides Batman). This time, crooks are using anti-tank guns to knock over armored cars in Metropolis and Gotham City. Batman is afraid these powerful weapons will spread to every city if they can’t track down the source. A few of the thugs committing these crimes have been apprehended but they’re not talking. 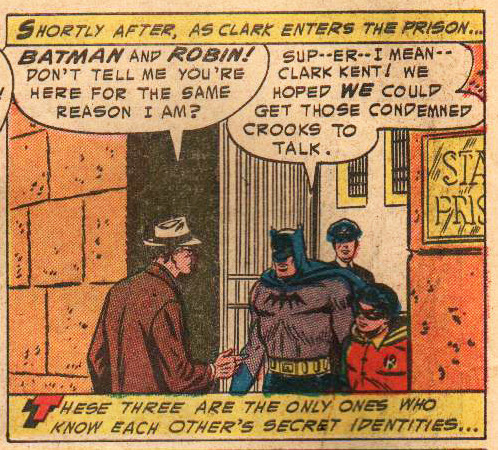 Clark Kent goes to the State Prison to interview the criminals for the Daily Planet and runs into Batman—who nearly gives away Clark’s secret identity. Batman you idiot! Lois Lane also shows up and the two reporters are taken hostage during a prison break. Four pages in and nothing really unreasonable has happened. Hold on because things change quickly with page five! 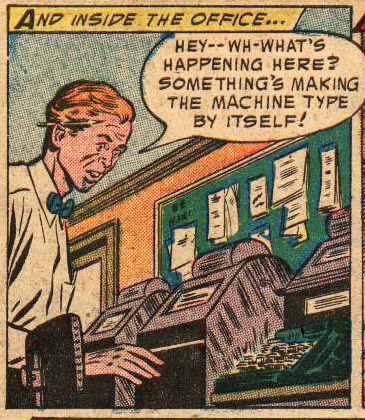 As the gangsters and their captives drive past the Daily Planet, Clark uses his X-ray vision to operate the newspaper’s teletype machine, and type out the details of his kidnapping as if by magic. Really? You can type with X-rays? This tips off the police and subsequently Batman and Robin who realize it’s up to them to catch the crooks and save Lois since Superman’s unable to act without revealing his secret identity. 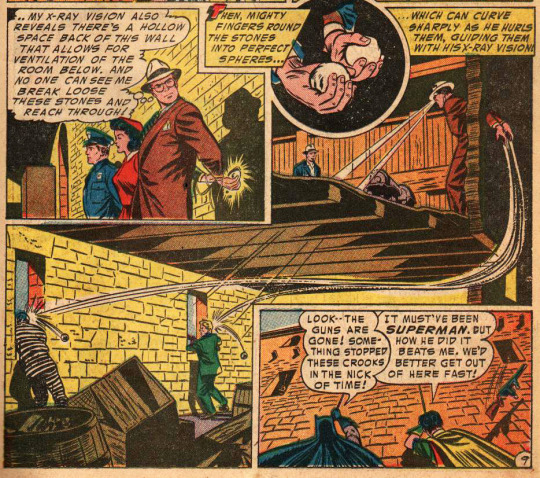 Trailing the criminals to their hideout in an isolated old stone fort, Batman and Robin try to sneak inside. 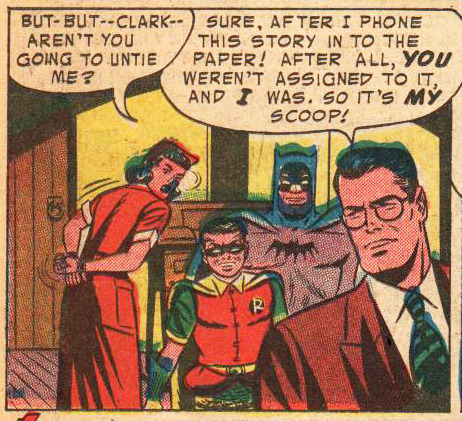 Their attempts are pretty clumsy and they’d be dead if it wasn’t for Clark’s implausible assists. Clark secretly throws some balls and guides them to their intended target with his X-ray vision. So anything Superman needs to do that he doesn’t have a special power for, he just uses his X-ray vision. Can his X-ray vision do my laundry and return my library books too? 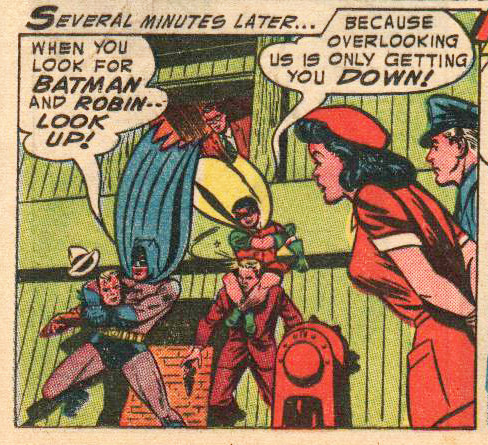 More unbelievable nonsense ensues until the criminals are rounded up while being subjected to Batman and Robin’s tag-team puns. 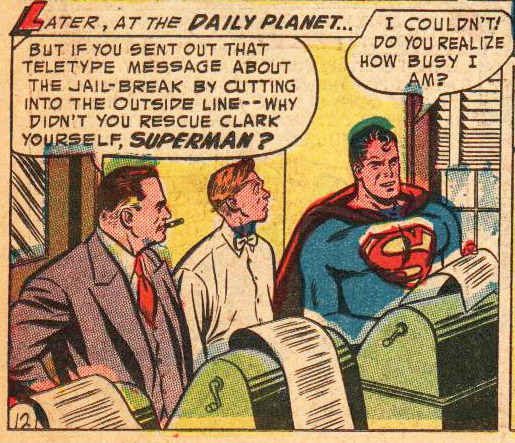 …and Superman explains why he used the teletype to alert everyone to the jailbreak instead of taking care of it himself. Ha! You tell ‘em Superman. Oliver Queen sprains his ankle horseback riding and he’s afraid if Green Arrow is out of the public eye, his secret identity may be in jeopardy. 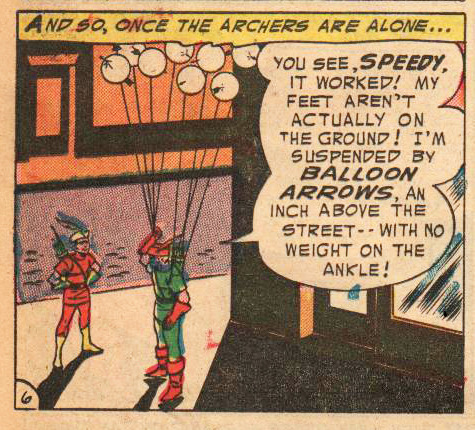 Using their Arrow-plane to track down some crooks looting a museum, Green Arrow is able to fight crime without standing up. 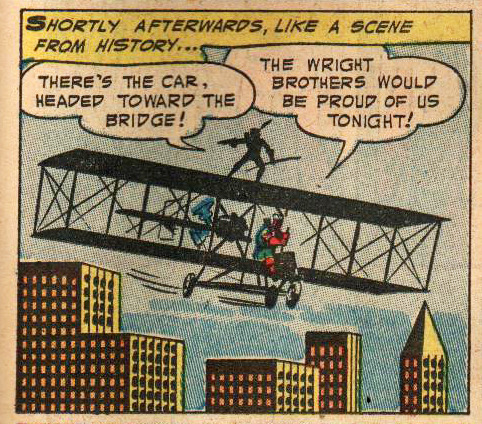 When the Arrow-plane is knocked out of commission, the archers “borrow” a rare, antique plane from the museum and apprehend the criminals. The Wright brothers might be proud of you but the people at the museum are not going to be happy about what you’re doing with their irreplaceable exhibit. After more crime-fighting from the air, the Emerald Archer is afraid people are going to suspect he’s Oliver Queen if he isn’t seen standing. He’s lucky this is a comic book, otherwise his plan would never succeed. No one noticed all the balloons tied to him. NO ONE! Maybe all the residents of Star City are blind. Luckily, by the next day he’ll be able to walk again, and we won’t be subjected to any more of these ridiculous schemes. At least until next month. Oh! Nick Cardy drew this? He became famous for his art on Aquaman and the Teen Titans about 10 years later, and also for the many covers he drew in the early 1970s. His style isn’t instantly recognizable here, like it would become in the future, but it’s interesting to see an early example of his work. Tomahawk’s frontier adventures, set during the American Revolution, appeared both as a backup feature and in his own title, from 1947 to 1972. His young sidekick Dan Hunter is always referred to using both names, at least in this story. Although it’s not really a superhero story, there is a villain, The Black Falcon, with a colorful name, a mask, and a gimmick—using falcons to help commit robberies. 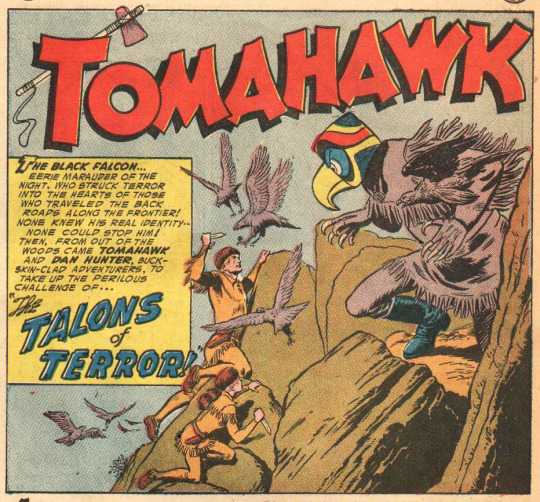 Tomahawk and Dan Hunter go undercover, enticing the Black Falcon to act. Falling in the trap they set, the Black Falcon gets dye on his hands which soon gives away his true identity. It’s a fairly solid story—part mystery, part western—and just the sort of thing that might appeal to kids of the Silver Age.